Nicole Jones and her husband owned a furniture store in Aurora, Colorado where they gave every moment of their lives to operating their store. Their young daughter grew up among the refurbished dressers, bookshelves, stacks of inventory boxes, and tucked behind the checkout counter. It was just part of her young life. Open 6 days a week, as a retail shop owner, vacations and holidays rarely exist, and when you are a sole proprietor, your business IS your life. It’s full steam ahead at all times. However, in October 2014, Nicole and her family lost it all after a young driver, who was texting, hit her head on while driving down the road, and everything came to an abrupt halt. I’m a sucker for craft markets, especially vintage ones. So while I was interviewing a store owner for an article I was writing, I noticed a postcard on her counter for Simply Vintage Market. I’d never heard of it, but the well-designed card caught my attention, and I looked it up. Much to my surprise, the market had a short, but solid presence on social media (I love that). It looked like they had some great vendors lined up, so I marked my calendar, grabbed my camera, and convinced my husband to drive to Pueblo with me to check it out. Most of the time I don’t mind living by a budget, but occasionally I find myself in a place where I would love nothing better than to throw my budget out the window…or wish I had a bigger one! This market was one of those times. Handcrafted silver pendants, vintage apparel, and furniture, gorgeous doors with painted glass panes. Wood journals, decorative farm implements that I wish I had a huge wall to display them on, and I could go on. I discovered it was their very first market, but from the looks of it, I would have sworn they had been organizing events for decades. Detailed, warm, welcoming, organized, clean, quality vendors, and visually tantalizing. I loved every bit of it. This was not your typical “craft fair.” I jotted down names of several artisans that I fell in love with and then set out to find the person responsible for such an excellent market and what their story was. Every business has a back story, every new product or service is birthed out of someone’s passion or experience. I went on a hunt for “the story”. Her tale of losing everything but re-discovering herself is incredible. At first, I was taken aback at how young she was. Based on how well the market was organized, I expected a person or a group of people, with years of experience in event planning and organization at the helm. Turns out, this was Nicole’s first ever event, and with the support and help of her family, they did an A+ job! Think for a moment what your life would look like if an accident or injury took away your livelihood, all that you had worked so hard for, and left you in the hospital, unable to walk or take care of yourself. Where would you be emotionally or physically? For Nicole, it was a long, hard road. Finding herself in a wheelchair and needing constant care, she was forced to move in with her parents. Depression set in, and she struggled with her new way of life. Thankfully, she didn’t stay there. That was over 2 years ago, and today she is out of her wheelchair and walking with a cane and very thankful that she is able to walk! Having to sell off their inventory, Nicole and her mother participated in a vintage market in the Denver area about a year ago. After the vintage market, her mother encouraged her to start her own market; after all, having grown up with parents who restored Victorian houses, Nicole learned to love and appreciate all things vintage and antique and had the knack for organization. Knowing she would never return to retail, she liked the idea of having flexibility with her time, being able to be home with her daughter, and yet still be involved in the vintage and upcycle industry. By this period, her family had moved to Pueblo, and so after some long thought and encouragement, she started SIMPLY VINTAGE MARKET. What began as a horrible tragedy was turning into an opportunity to do something she loved without the stress and commitment of a retail shop. Instead of thinking of what the accident had taken away from her, she looked at the opportunity it was now providing. 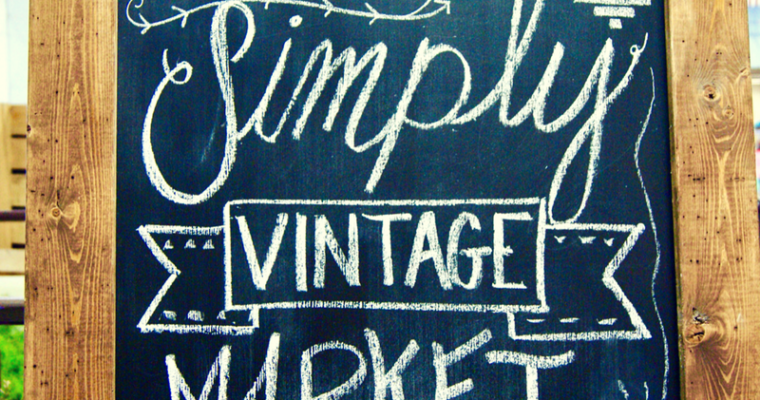 Not wanting to be a typical “craft fair” or antique show, the purpose of Simply Vintage Market would be to bring together quality artisans from around the country. From the moment you entered the doors until you left, the goal was to provide a fun, exciting and well-organized event. Not only for the customers, but also for the vendors. Shunning traditional avenues of marketing, Nicole determined a very specific target market for the show. She adjusted her social media campaigns to directly interact with those who had particular interests and within specific age ranges. She also spent extra time vetting potential vendors. Everything she did was professional and detailed. Understanding that happy vendors lead to favorable results, Nicole and her family went above and beyond to make sure that vendors were taken care of in every way before, during, and after the event. The first market was a huge success! I hope you can join us at one of her upcoming events in 2017. If you know someone with a talent for creating unique pieces, recommend they contact Nicole.